Coupled with a perfect sense of timing and delivery, Eddie can take the most mundane particle of life and flip it into a side-splitting 'where'd that come from?' work of art that gives audiences cause to pause and take notice of this on-the-rise comedic talent. His comedic brilliance captures and retains the attention of audiences and takes them on a smooth ride to the other side of hilarity. His talent takes him from writing impeccable stand-up material to the world of Acting, Event Hosting, while featuring in Comedy Clubs all across America. Eddie has blessed stages from New York, Philadelphia, L.A., Atlanta, Chicago, Miami, and of course Washington, D.C. Winning a supportive fan base wherever he goes fans show him nothing but love because they recognize his unmistakable talent.Eddie Bryant was the driving force behind establishing Laugh Out Loud@ Club Elite, located in the Washington DC area. During that time, not only is he a touring comedian, he served as operations manager, booker, & resident host. Currently he produces one of the Hottest Monthly Live Varity Shows in Washington DC www.TheInsideJokes.com He tours regularly throughout the US, playing venues such as The Riot Act Comedy Theater, Washington, D.C.; Punchline Comedy Club, Atlanta, GA; Caroline's Comedy Club, New York, NY; The Funny Bone, Virginia Beach, Va., Richmond Va., & Columbus, OH; The Comedy Zone, Alexandria, VA.; D.C. Improv, Washington, D.C.; NY Improv, New York, NY; Jokes & Notes Comedy Club, Chicago Il; Laff House, Philadelphia, PA , Oakland Paramount Theater & more. Festivals, Competitions and TV include: 2009 Bentzen Ball Comedy Festival- Washington D.C., 2008 season of Martin Lawrence presents The 1st Amendment Stand Up on Starz Network- Episode 312; 2008 season of B.E.T. 's One Mic Stand; Finalist, Bay Area Black Comedy Competition - 2008, Oakland, CA; H.B.O. Mobile, (TV) Washington, DC 2007; Laffapalooza! 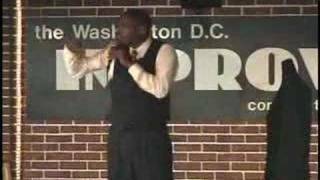 2005 - “New Faces” Showcase, Atlanta, GA; Sierra Mist 2005 “Next Great Comic” Semi-Finalist, National Competition; B.E.T. 's 'Coming to the Stage' 2004.Must be 21 & up to enter.